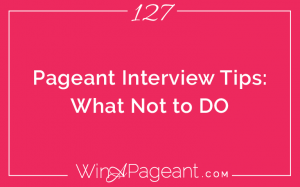 Last week, we covered what not to say in your pageant interview. This week, we’re going to talk about what not to do. In most cases, judges want a woman that is relatable. When you show up as an extremist, it is uncomfortable to the judges. There are 3 spectrums at play that you have to manage with self-control and patience so you don’t end up on the extreme ends of the spectrums. 1. The first spectrum is movement. It ranges from standing like a statue to compulsively rocking, fidgeting, or spinning around. Both of these extremes are unnatural. The middle-ground is standing comfortably, walking around when it’s appropriate, talking lightly with your hands, and calmly looking the judges in the eyes. 2. The second spectrum is emotion. It ranges from raging tears or uncontrollable laughter to stoic, stone-face with a flat tone. The over-emotional extreme comes off as intimidating and out of control. The under-emotional extreme comes off as un-relatable and lacking interest. The middle-ground is sharing a dynamic series of emotional responses without letting your emotions get the best of you. 3. The third spectrum is talking. It ranges from fast and long-winded speech-like answers to one-worded responses. Long-winded answers usually mean fewer questions get asked, therefore the judges from getting to know you through a wide range of questions. The one-worded answers don’t allow you to express your true self. The middle-ground is giving enough time to answer without confusion. Some questions will naturally need more time to explain than others. With practice, you’ll gain a better sense of appropriate timing, but most questions can be answered in about 15-30 seconds. Your pageant interview is going to fly by. Not only is it fast, but interview is like living in a time-warp where every minute feels like 5 seconds. So, you have to be sure you maximize every moment and communicate like a pro. Today, we’re going to cover the things that many women accidentally or nervously say that stand to waste your time and annoy your judges. 1 – Do not say great question. It wastes time and adds no value. 2 – Do not repeat the question. It wastes time and slows the energy and flow of the interview. 3 – Do not share gossip – not about you, your family, your friends, nor celebrities. If you find yourself saying, I heard that she… or They say she… stop yourself and start again with something about you. 4 – Do not tell lies. Even if you wish they were true. If you hate pancakes, don’t say you’ll eat them on the iHop fundraiser day. If you plan on changing your platform for the state pageant, don’t act like you won’t. If you aren’t a huge fan of small children, you don’t have to say you hate them, just focus on how you love to interact with adults. 5 – Do not give cliche answers. Most cliche answers are built around stereotypes, which lump people together. You need to stand out, so if a cliche comes into your head, make sure you explain it from your own personal perspective. 6 – Do not say you’ll get back to them about something you don’t know. That is one of the most annoying answers of all because the likelihood of that actually happening is 1% and even if you did get back to them, the judge won’t care about your answer after the pageant. Instead, just say you don’t know. 7 – Do not compromise your values. If you end up losing because of your personal values, be grateful that you didn’t win. If you win based on a compromise, you’ll have a horrible year. If someone asks about your stance on the Bible, tell them honestly with love and compassion. Don’t give up what is precious to you to please a bunch of strangers. Pageant interview is the only phase of competition that happens behind closed doors, so it’s hard to know what to expect in there. Especially if you’ve never really seen it done right. There are the obvious expectations of format, like sitting, standing, 1:1, panel; and the physical environment like if the interview will be in a hotel conference room or a school cafeteria and whether or not there will be a podium or other props. That stuff is good to know. I recommend asking your director all those questions before you get to the pageant so you have an idea of what to expect. But still, regardless of all those things, there are some universal truths that you can expect. That’s what we’re about to discuss. If you know these universal expectations, then it won’t matter the setting or format – you’ll be able to rock your interview! 1. You will be nervous. 2. The time will go by way faster than you will even know – if fact, you may actually think they jipped you on the time. 5. There will be no applause when you enter or exit. Nor will there be reactions or feedback – ever. Basically, you have no absolute way of truly knowing how you did nor will you ever be able to do that exact interview again in the same way. Once it’s done, it’s done forever. 6. The judges are going to love you – even if they decide not to pick you. Expect acceptance and they’ll likely deliver. 7. You’ll forget everything as soon as you start a new activity. So, take notes about the questions they asked and what came up for you before you forget.